Have you heard? 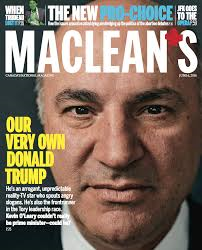 Even here in Canada Trump trumps everything else in the news so maybe those in other countries haven’t heard; Canada has its own Donald Trump. Before Shark Tank there was Dragon’s Den. The reality TV show about five Canadian investors investing in small business became so popular it spun off down south and Kevin went with it. Now he needs to be even bigger and with the success of Donald Trump he can see Himself seated at the top up here. He thinks Trudeau is driving the country into ruin and he’s going to fix it as if it’s a big money-making corporation where the weak are trampled underfoot by the strong and ‘successful’. He has no sympathy for someone who has lost all their money chasing a dream. He has disdain for the ‘tree-huggers’ who care for the environment more than the economy. He was a little late announcing his candidacy to avoid the debate in Quebec because he doesn’t speak French; he’s now taking a crash course. After all, he’s been living and working in the USA for years. Canada is ‘the cottage’ for him. I have a feeling, a sinking ‘it can’t be true’ feeling, that you are looking at our next Prime Minister.